On March 5, 2011 Leah Morgan died, after battling ovarian cancer for over four years. Tom and Leah have been pillars of strength for OSAT since its very beginnings. They were among the first experienced mountaineers to join Jim Hinkhouse in the Spring of 1991 to help train participants on the first AA Mount Rainier Expedition in the skills needed to climb safely, beginning with the very first ice ax arrest practice event. They both shared their wilderness wisdom and skill with OSAT throughout the past twenty years, as well as being welcome faces at social events eager to share their love of the outdoors with new members as well as old friends. Upon looking at Leah, and knowing Tom's boundless enthusiasm, one would wonder how she managed to summon the energy to keep up with Tom throughout their long and loving marriage, but keep up she did! 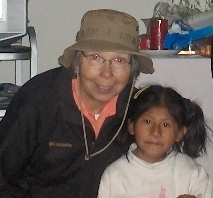 Even after her diagnosis Leah kept pace with Tom, and in spite of her cancer, they participated in two church missions to Peru in 2009 and 2010, working with orphanage children there. Leah was a life-long teacher, and she and Tom both continued to volunteer at her school. In the early years of OSAT, Leah invited Jim Hinkhouse to speak to her class of elementary students about mountaineering as he was preparing to go to Africa to lead a group from One Step at a Time on a climb of Mt. Kilimanjaro. Tom has a video of that talk, the only known video of OSAT's founder. Everyone who knows the Morgans will recognize how difficult the future will be for Tom without Leah at his side. Tom is still a frequent visitor to the Tiger meeting, in spite of being in line for a second hip replacement. He and Leah have faced the past few years of Leah's cancer with characteristic good humor, optimism, and courage. We all pray for Tom and their family as they seek ways to deal with this loss. Memorial donations can be made to the Monroe Public Schools Foundation, 200 East Fremont Street, Monroe WA 98272. A donation form is available on the web site, as is a click-and-pledge facility if you wish to make an online donation..